The production line for the processing and production of oil drilling pipe, is mainly divided into three steps, by using the upsetting machine, Intermediate frequency quenching and tempering machines, pipe threading lathes and some other machines. 2.400T upsetting force can meet all kinds of requirements of drill pipe, oil pipe. 3. 256mm cavity can produce all productsof oil pipe, drill pipe, drill collar. 6.The product of hydraulic upsetting machinehas not flash on the end of drill pipe. Hydraulic upsetting machine is widely used in oilfield, construction, bridge and other industries, is the preferred equipment to carry out large quantities, high precision upsetting forging production, which is very suitable for round steel, steel pipe, drill pipe, sucker rod, oil pipe and other long rod forging and forming. Moreover, hydraulic upsetting machine Improve the process which solve the flash on the end of workpiece that is important to the quality of OCTG. The PLC and automation control is easy operate and make better qualified products. The mainframe is a hydraulic driven horizontal die upsetting machine, the fuselage frame is made of high quality material, so that the upsetting machine has the characteristics of stable structure, good rigidity, high precision and good vibration absorption. Upsetting machine structural design is more ingenious, so that equipment is more reliable; automatic nesting auxiliary machine design concept is particularly advanced, the organization can accurately and timely delivery of materials to the designated station. TZX series intermediate frequency quenching and tempering production line is a kind of device with a high performance product by our company. It can complete various sucker rod, oil pipe, drill pipe, drill collar, tubing and steel rod heat treatment processing. It adopts the high strength bed design, have a variety of configuration and can be chosen by the customer. The fully automatic feeding device realizes the unmanned operation of the whole production line, which greatly reduces the labor cost. QK series pipe threading lathe is also called oil country lathe, big bore lathe and hollow spindle lathe are economical CNC horizontal lathe, which are not only suitable for oil pipe thread turning, but also widely used in all works of life such as automotive, petroleum, military and other mechanical processing. 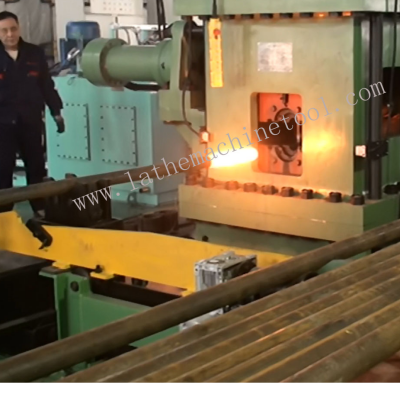 The lathe has the advantages of high efficiency, low scrap rate, good consistency, etc. The production line is suitable for processing varieties of drill pipe, drill collar, oil pipes, etc. Water-proof plastic film package with foam protection in each corner. Solid Seaworthy Wood Box Package with Steel Belt. Save space as much as possible for container loading. The package is wooden box which is heat treatment. Or pack it according to customers special request. Anyang Xinheng Machine Tool Co. Ltd. is a professional machine tool manufacturer since 1946. Our factory covers an area of more than 30000 squares meters, equipped with our updated manufacturing facilities. We have LATHE, CNC LATHE, PIPE THREAD LATHE, SPHERE TURNING LATHE etc. We have attained ISO9001:2000 International Quality Control System Certification. Our products are sold both at home and abroad, and they are very popular around the world. Welcome to contact us !